This morning, the kids went back to school after the Easter break. Most of my frustrations with getting the kids off to school each morning aren’t rocket science. There’s no brain surgery involved. It’s all Simple Simon stuff like brush your teeth, put on your shoes, make your bed. Yet, getting the kids to complete these basic tasks, which should be as automatic as breathing, is like extracting teeth and they head for the hills. Or, should I say, some form of electronic device if I haven’t got them under lock and key! No! It’s not the kids threatening to run away. It’s you and this time you’re really and truly going and no cries of “Mummy! Mummy!” are going to bring you back. Oh no! At least, not until you’ve actually finished your cappuccino or skim chai latte and at least flicked through a magazine. I don’t know where runaway mothers go these days and whether people still join the Hari krishnas or move to Nimbin. However, if you’re going to runaway, you have to go somewhere exotic. You just can’t doss down in the local park! Anyway, I’m not running away from home today because, as I said, it’s a new school term and we are a new family. The kids ticked all the boxes and we were even on time. You see, miracles do happen! 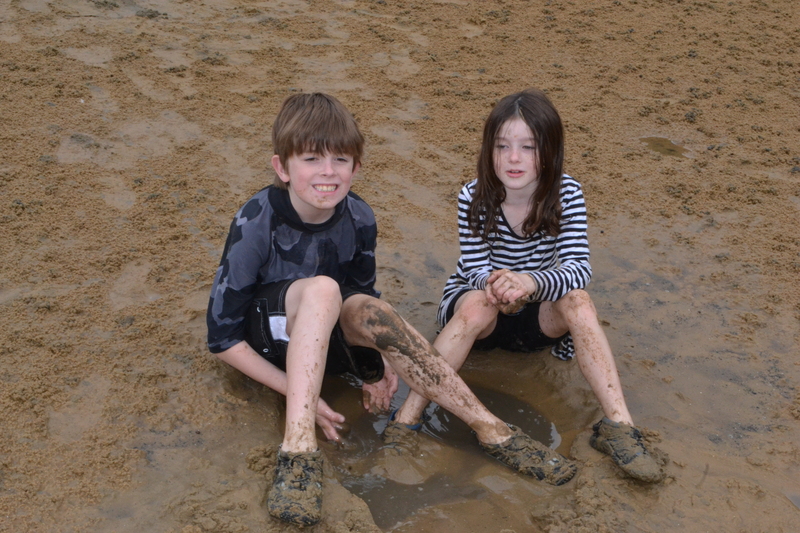 The kids on school holidays…Pittwater, Palm Beach. However, I thought I’d recap a little so you could appreciate the huge Everest of obstacles we’ve had to overcome to get there. Firstly, there’s “The Case of the Missing Shoe”. While technically not a serial killer because nobody is dead or at least nobody’s dead yet, trying to find that expletive missing shoe when we’re rushing out the door, is a killer. These days, after years of prolonged exposure, my nerves have been so completely and utterly frazzled and fried that at the mention of the word “shoe”, my entire being explodes in lurid panic. Our kids have a uniform so it’s not like they have to decide what they’re going to wear and which pair of shoes. It’s not a fashion parade. It’s school. One morning the impossible happened. I pulled up out the front of the school and my daughter piped up: “But Mummy. I haven’t got my shoes on!” I looked over into the backseat and there she was sitting there in her socks! Her brother has been no better. One morning he managed to get to school without his bag! How hard can it be? Do I really want to find out?!! While the case of the missing shoe has been a perpetual drama, an even more recurrent nightmare has been: “The Case of the Uneaten Lunch”. While the media harps on and on about childhood obesity, I’m lucky if my kids eat anything at all and my daughter in particular is living, breathing proof that children can survive on air alone without starving to death. The dog who is something like the size of an overweight hippo despite his diet, is further proof. I lovingly made those sandwiches with my own blood, sweat and tears each morning while desperately waiting for my coffee to kick in and that’s the appreciation I get… a wagging tail! Just like bad luck runs in threes, so do bad habits…or at least our bad habits. This brings me to our third and hopefully final fault although I’m sure there are more faults hiding under the carpet or perhaps its all the books stacked up on top of the carpet. Mind you, I can’t see how having lots of books could ever be a fault just like you can’t have too many friends. Anyway, our third and final (yes!I said final!!) fault is running late for school. As far as my husband is concerned, my struggles to get the kids off to school on time are a complete and utter mystery just like those other great mysteries of the world such as the creation of the universe, whether Santa, the Easter Bunny or even the tooth fairy exist and who built those huge, enormous statues at Easter Island. These are things that keep even the most mindful person tossing and turning at night, crazed by all sort of theories and possibilities but no definite proof. Anyway, we have had a dreadful track record with running late for school and it really doesn’t make a lot of sense. 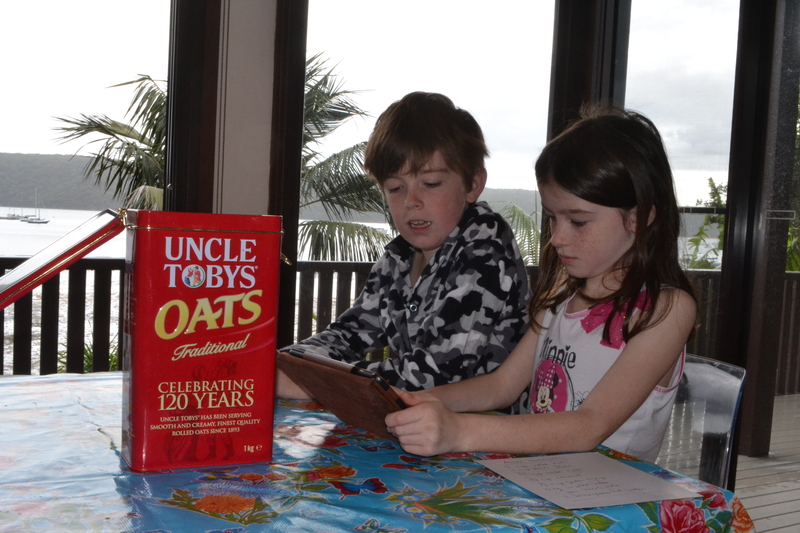 When Geoff leaves for work at 7.00am, the kids have usually had their breakfast and are dressed or almost dressed when he leaves and ideally they are starting to get stuck into their homework which isn’t much at their age. We have a list on the whiteboard and they, well there’s usually one of them who is having a good morning and the other one who has fallen off the rails and in the process of trying to keep track of the two of them while I very slowly eat my breakfast, drink my coffee and take what really does amount to two mouthfuls of tablets, that one somehow manages to slip through the net and usually finds some kind of electronic device. I also have to confess that I am another source of early morning distraction. Inspiration hits, usually some time after Geoff leaves and what starts out as a few quick lines, soon evolves into an epic poem something along the lines of the Iliad or a post for the blog and a thousand words have found their way on paper. How often does that inspiration hit on paper and not when I’m sitting at my computer screen and I can just type it straight in???!!! To be fair to myself, too, I am doing this parenting thing while living with a high maintenance chronic disease and while I do get on with things and squeeze the marrow out of life, that doesn’t mean that it doesn’t have a major impact on my daily life. It does. However, that said, we still need to live and that means getting the kids to school on time with both shoes firmly attached to their feet, lunches made and bags packed. As I said, the start of each school term is like the launch of a whole new year and along with it the usual vows that things are going to be different even though we are still who we are and nothing much has really changed. However, today is the first day of term and they were on time. Their shoes weren’t lost and if they’ve eaten their lunches, that will be a trifecta! This entry was posted in Humour, Parenting, Uncategorized and tagged adversity, back to school, chores, chronic illness, Climbing Everest, happiness, humour, kids, love, parenting, philosophy, school on April 29, 2014 by Rowena. I have always understood that the pavlova, named after the famous Russian ballerina Anna Pavlova, was created by Australian chef Bert Sachse from the Esplanade Hotel in Perth and prepared for her while on tour. However, like most great things which are considered uniquely and indisputably Australian, there’s often a foreign element. 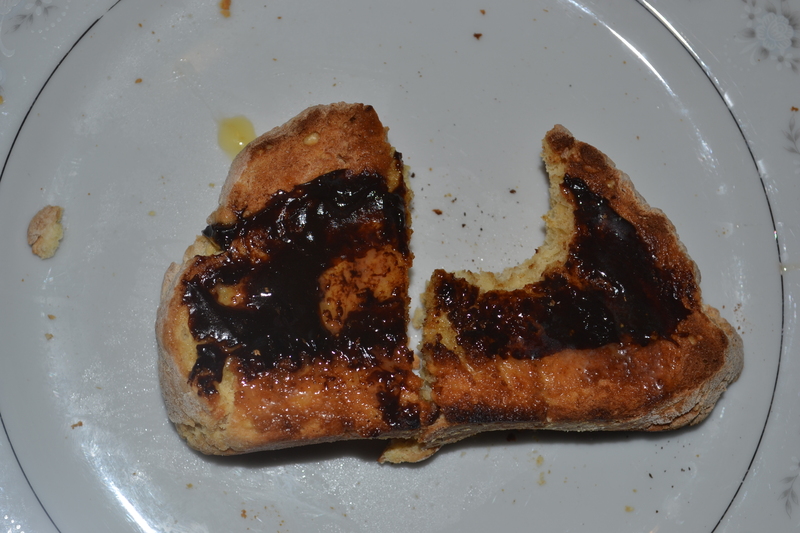 Hey, even Vegemite and the Australian Women’s Weekly are foreign owned. So it also appears that the Kiwis (AKA New Zealanders) are trying to take claim to our pav. Is nothing sacred?!! That said, a pav just isn’t a pav without kiwi fruit on top so I reluctantly got to give the kiwis a bit of credit. This recipe comes from Margaret Fulton who, now aged in her 90s, has to be considered “The Grandmother of Australian Cooking”. I grew up cooking from her cookbooks as a child and even though we have never met, she feels like some kind of surrogate cooking Supergran and I’m sure most Australian women would feel much the same. So much more than a name, she’s part of the family, albeit on the shelf. This pavlova is my signature dish. It is relatively simple but I always receive gushing praise and have been lauded as the “Pavlova Queen”. With its crisp crunchy crust and soft marshmallow interior, it’s amazing and I find so many people truly love pavlova and nothing compares to the classic home made version. Somehow, it seems to make everybody deliriously happy. Pre-heat oven. There is quite a difference in settings depending on whether you are baking the pavlova in a gas or electric oven. If you are using electric, pre=heat the oven to a slow 150° C (300°F). If you are using gas, preheat it to a very hot 230°C (450°F). Grease tray. I use a pizza tray covered in foil and spray it with canola. Separate egg whites into glasses and transfer each egg white to the main bowl in case a bit of yolk slips through the net. You don’t want to waste the lot! Beat egg whites at high speed until soft peaks form. Add sugar one tablespoon at a time beating well after each addition. Stop beating after all the sugar has been incorporated. Fold in vanilla and vinegar. Pile mixture onto the tray and swirl it around creating attractive curls. Cooking instructions vary depending on what type of oven you have. If using an electric oven, put the pavlova in and bake for 45 minutes and then turn the oven off and leave it in there for 1 hour. If using a gas oven, turn heat to the lowest temperature. Put the pavlova in and bake 1.5 hours or until crisp on top and a pale straw colour. When pavlova is cooked, remove from the oven and cool completely. Now you essentially drown the pavlova in cream. You can either buy the tubs of very thick cream which you can pour straight onto the pavlova or you can whip some cream up yourself. We always add a bit of icing sugar and vanilla to our whipped cream. Just to make the pavlova healthy, despite all that sugar and cream. Top the cream with fresh fruit which is typically slices of kiwi fruit , banana and strawberries along with some passion fruit. My sister-in-law used frozen raspberries, defrosted of course, and these went very well with it as well. She actually put the raspberries underneath the cream and that looked very good. Pavlova is best made the day before and it’s not something you can easily squeeze into the oven in between cooking other things what with juggling oven temperatures and it needing a slow oven. I have been making this pavlova for many years and haven’t had a flop until recently and I think that’s from trying to cook it straight after having the oven hot for something else. Enjoy and just remember that when you serve the pavlova with fruit, that automatically makes it healthy cancelling out all the other stuff. 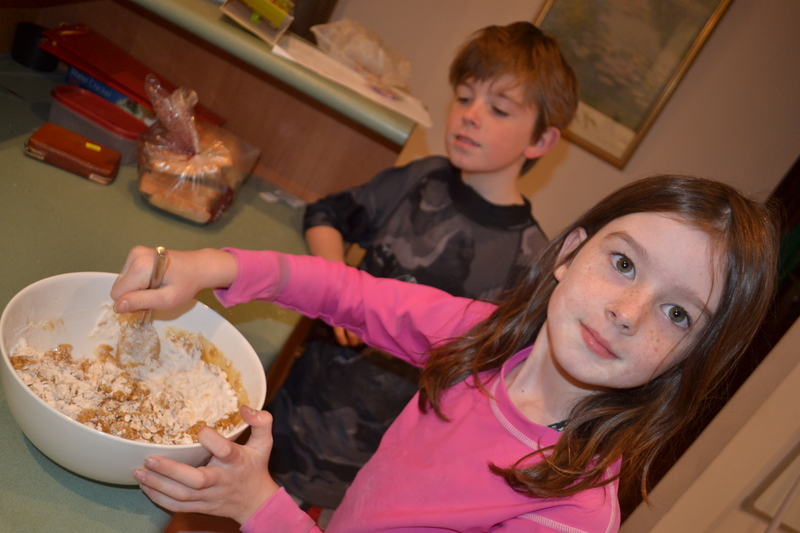 This entry was posted in Baking, Kids learn to Cook, Parenting, Recipes, Uncategorized and tagged Australian cooking, baking, Margaret Fulton, Pavlova, recipes on April 5, 2014 by Rowena. 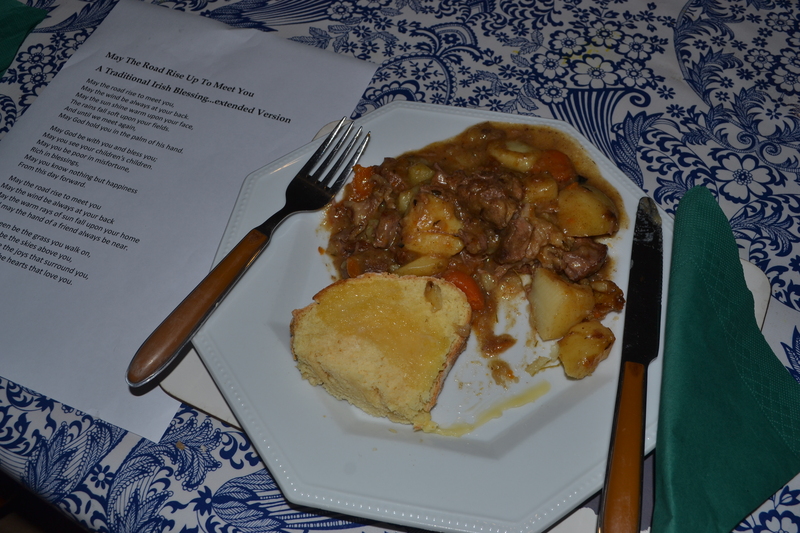 Just to recap a little, we made Irish Stew last night to commemorate the 160th anniversary of my Great Great Great Grandfather John Curtin’s arrival in Sydney, Australia from Cork City, Cork Ireland onboard the Scotia on 4th April, 1854. I forgot to mention earlier that we are all fighting off chest infections and given my low-immunity status, we are wearing masks around the house. Well, we couldn’t eat with the masks on so we probably undid all our protective precautions. I must say these masks feel very uncomfortable. Your face heats up. Geoff’s glasses fog up. Then there’s just the whole psychological aversion to wearing a mask and feeling rather freakish. I’m not some kind of germophobe. At least, I never used to be. This is my new way of life perhaps.. at least, in winter. Need to find myself some fancy versions so I can poke a bit of fun at this stupid device. That said, just because you need to do something that doesn’t mean I need to like it! Anyway, back to the Irish Stew. While frying up the onions, I found out why the Irish are crying. My goodness! Those vapours really got to me! 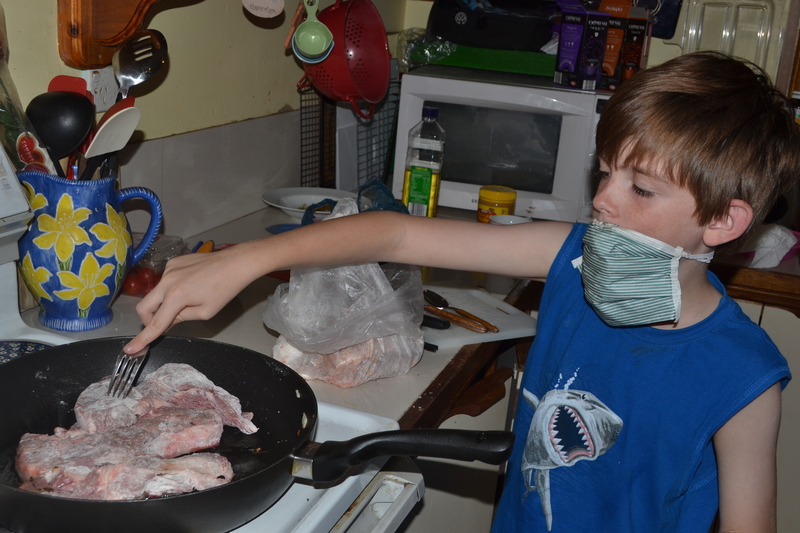 Mister cooking the chops with face mask on. 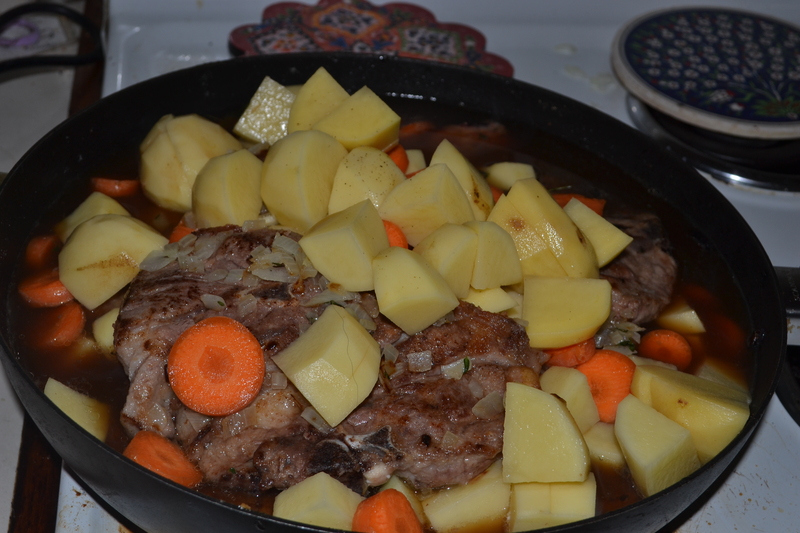 This recipe provided enough stew to feed our family for two nights and once I’d recovered from peeling all those potatoes, was a pretty easy meal to cook. Just left it on the stove to cook itself. We will definitely be eating this stew on a regular basis from now on. Irish Stew=adding the veggies to the meat. 1.25kg lamb chops, trim off fat. 1) Wash, peel and dice potatoes and wash and slice carrots and put aside. 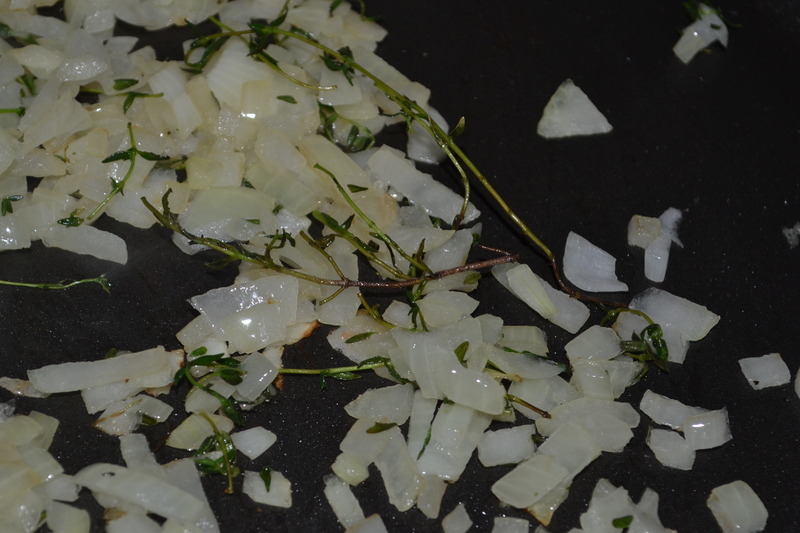 3) Heat 1 tablespoon of olive oil in a large heavy frying pan on medium heat and when bubbling add onion and thyme leaves. Cook stirring for 3 or 4 minutes or until tender and transfer to a bowl. 4) Place flour and chops in a bag. Shake until chops are coated. 5) Increase heat to high. Heat 1 tablespoon of oil in pan. Add half the chops. Cook for two minutes on each side and transfer to a plate. Repeat with remaining oil and chops. 6) Leave half the chops on the bottom and cover with half the onion mix, half the potatoes and carrots and then cover with the remaining chops and cover these with the remaining onion mix, potatoes and carrots. 8) Bring to the boil, skimming off fat where necessary. Reduce heat to low and simmer for 1 hour 30 minutes. 9) Remove lid and simmer until sauce has thickened to desired consistency. I ended up simmering it for at least an hour and the sauce became more of a gravy, which we preferred to a watery soup. 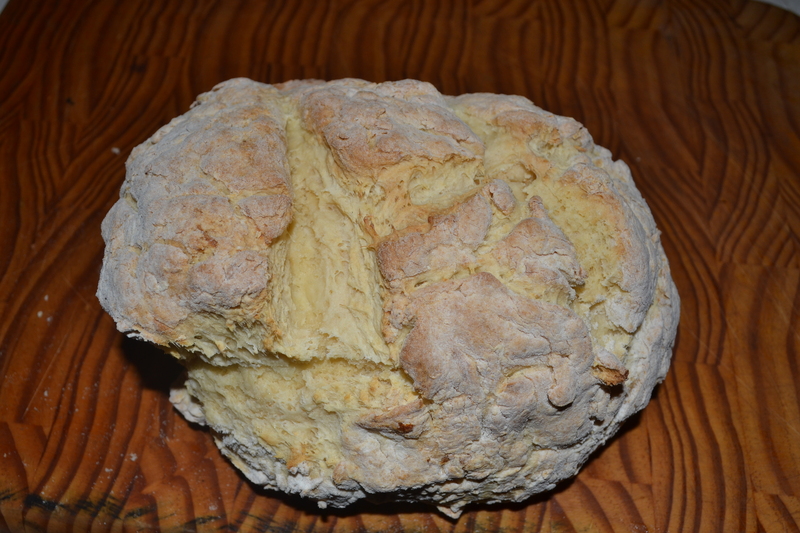 10) Serve with buttered slices of Irish soda bread straight from the oven. 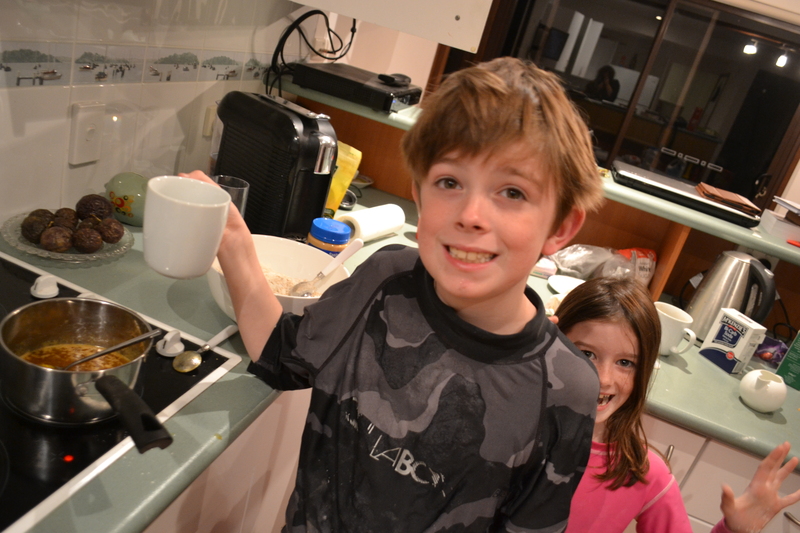 This entry was posted in Baking, Kids learn to Cook, Recipes, Travel, Uncategorized and tagged cooking, Cork City, dinner, ireland, Irish History, Irish Soda Bread, Irish Stew, lamb, recipes, Sydney on April 5, 2014 by Rowena. Last night our family celebrated what I’ll call a brief trip to Ireland. Unfortunately, we were still very much at home in Australia. However, we did the next best thing. We cooked ourselves an Irish Stew and some Irish Soda Bread, listened to Riverdance and instead of our usual grace, we said an Irish Blessing. We even had green serviettes. 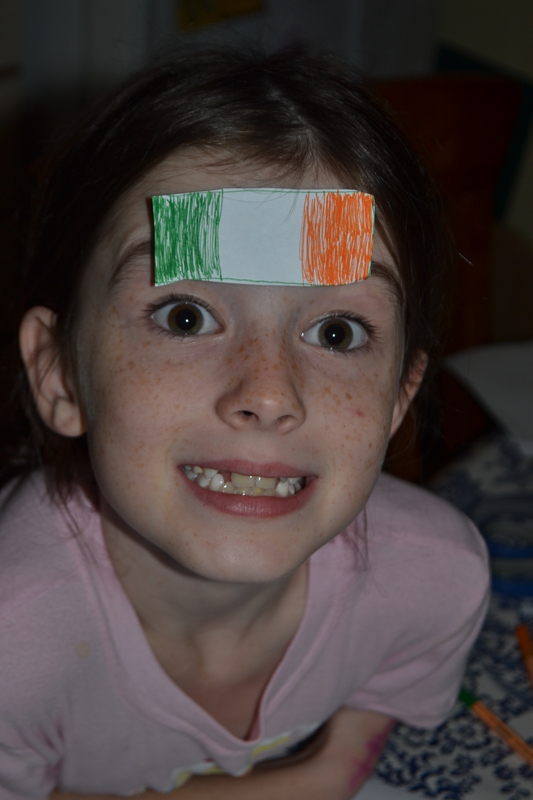 While it wasn’t St Patrick’s Day, we had a special Irish celebration of our own. You see, yesterday marked the 160th anniversary of the arrival of the first Curtin in Australia. 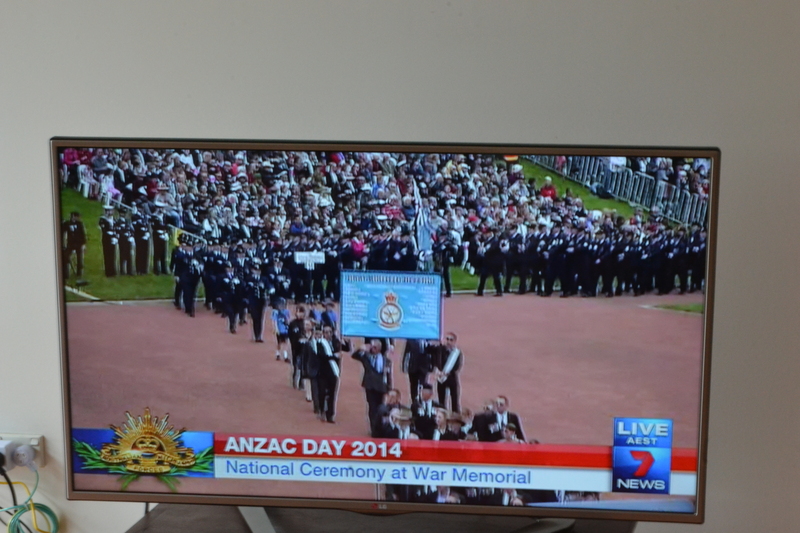 His name was John Curtin and he was my Great Grandfather’s Grandfather. John Curtin came from Cork City, County Cork and he was an Able Seaman arriving in Sydney on board the Scotia on the 4th April, 1854. As I’ve never been to Cork City, County Cork, I did the next best thing and went their online via Kieran McCarthy’s blog. I recommend you pop over for a quick visit yourself. Like me, you might find out it extends into quite an extended sojourn! Unfortunately, we haven’t been able to find a picture of John Curtin or the Scotia but the Scotia was one of those beautiful Tall Ships with white sails like tea towels billowing in the wind. These were the sorts of sailors who no doubt shared many, many yarns about their time at sea, especially stories about “Crossing the Line”, which referred to crossing the equator for the first time. These ceremonies were quite theatrical and sailors dressed up as King Neptune and his bride and the unfortunate initiates called “Johnny Raws”, were usually shaved with a very nasty, rusty implement and dunked. I will elaborate more on these ceremonies in a subsequent post. It is no wonder I’ve been so lost in my research. It’s riveting stuff! Of course, the journey itself wasn’t my only entertainment. 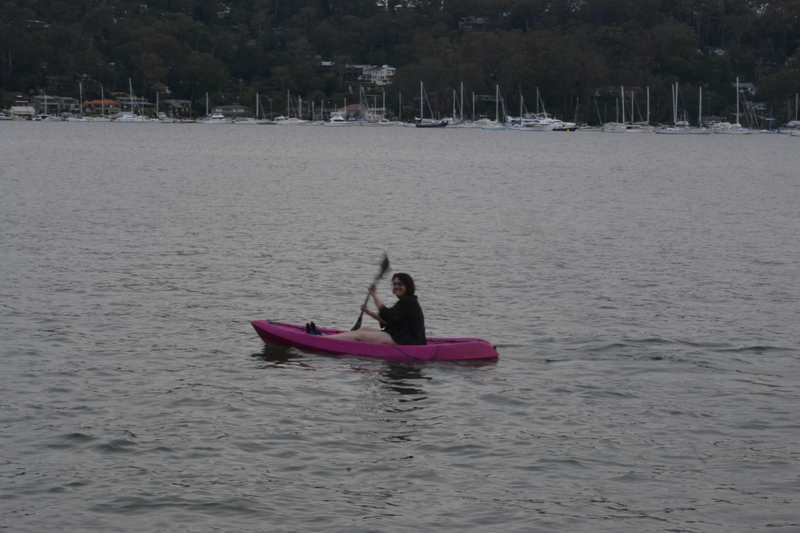 Their arrival in Sydney didn’t go unnoticed by the local water police. On the 10th April 1854, The Sydney Morning Herald reported that John Eatough, Edward Wall, William Ferris, Stephen Malone, Henry Franklin, and John Grur, six seamen belonging to the Scotia, were charged with obstructing a constable in the execution of his duty. It appeared from the evidence, that constable Cassidy, of the Water Police, went on board the Scotia, at the request of the captain, for the purpose of apprehending a man on the charge of drunkenness, and that whilst so engaged the prisoners combined to prevent him from executing his duty, that several of them struck him, tore his clothes, and otherwise ill-used him. At the trial, it appeared from the evidence of Captain Strickland that the assault was a most cowardly and unprovoked one, nearly the whole of the men having assaulted and ill-used the constable, who at the time was endeavouring to perform his duty in the most inoffensive way possible, and who was not in a position to command assistance. As there was no material evidence against Eatough and Greer, they were discharged, and the others were sentenced to pay a fine of 20s, each, or be imprisoned for fourteen days. Daniel Carlos, a Portuguese seaman, belonging to the Scotia, was charged with desertion. The evidence showed that he had been apprehended on board the American vessel Revenue, on board which he had managed to obtain an engagement through the Shipping Master’s office by means of a false discharge. This document represented him as being a man lately discharged from the Jane. Captain Strickland stated that the prisoner had shipped as an able seaman on board his vessel some months previously, but that he had since been disrated for incompetency. The pri denied, amid much laughter, that he either knew Captain Strickland or his vessel. The case was ultimately remanded until Monday (this day), for the production of the articles, &c.
Another man, belonging to the Scotia, named Engine Depouta, was also charged with desertion. Like his shipmate, Daniel Carlos, he was discovered with a false discharge in his possession, bearing the name of Robert Ripley. Having pleaded guilty, he was sentenced to 12 weeks’ imprisonment with hard labour, his Worship remarking that he considered this a case in which the full term of punishment ought to be inflicted, in consequence of the aggravation which the offence received from the possession of a false discharge. So while we do not have a great many details about John Curtin himself, we are slowly putting together some kind of jigsaw of his life or milieu. After looking at a selection of paintings depicting Cork Harbour and Sydney around 1854, we had our dessert. I thought it was only fitting for us to finish our trip to Ireland with an Australian pavlova oozing with cream and topped with sumptuous kiwi fruit, strawberries and banana. After all, although John Curtin wasn’t born in Australia, he did become an Australian. Actually, he wasn’t technically an Australian because he died in 1882 and that was 18 years before Federation. Let’s just say that he was an Australian before his time who still had a chunk of Ireland lodged in his heart. I really recommend you do something similar to share your cultural heritage with your family. Bring some of your assorted ancestors out of the closet and celebrate who they were and indeed what is a part of ourselves our very flesh and blood. You never quite know who you will meet once you start digging beneath the surface. I have posted the recipes separately to make them easier to print out. Just one note about this menu. It is best to make the pavlova the day before. This allows the pavlova to cool properly and it also allows you to juggle the use of your oven better if you only have a single oven. Pavlova is fairly quick and easy to make but it does need that hour to rest in the oven after cooking and can tie your oven up if you are trying to bake the bread. I don’t know how to wish you a Bon Appetit in Gaelic but there’s always 2,4,6,8 bog in, don’t wait! This entry was posted in Baking, Kids learn to Cook, Parenting, Travel, Uncategorized and tagged Australia, Australian History, baking, Cork City, County Cork, dinner, family meals, immigration, ireland, Irish, Irish Famine, Irish Soda Bread, Irish Stew, John Curtin, sailor, shipping, Sydney, travel on April 5, 2014 by Rowena.